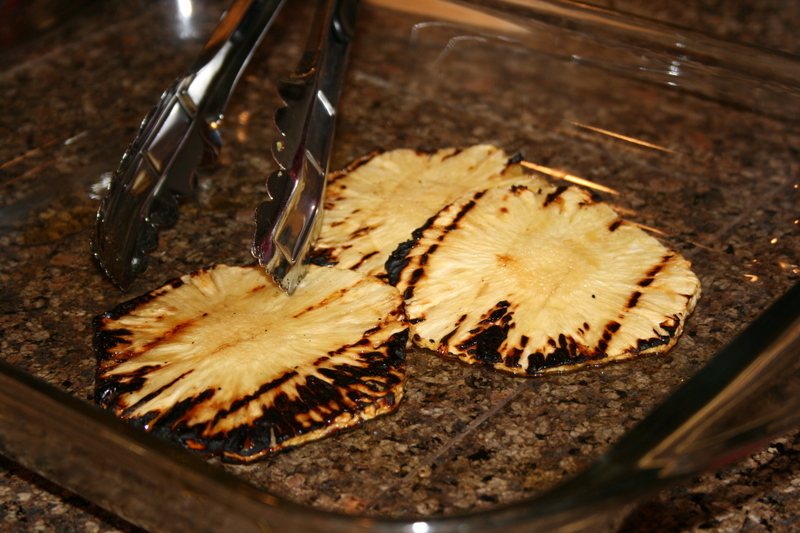 We just had friends over for a BBQ, and discovered a new favorite for the grill: Pineapple. We called them Pineapple Planks. This is all that was left by the time I could grab the camera. The blackened parts are not as yummy as the rest; these were the ones that got a little overdone. Cut off the top, bottom, and all the scaly sides of the pineapple. Sliced it into 1/2 inch or less slices. The one we had was still a little green, which helped it hold together better on the grill than if it had been super ripe. Laid them strait on a hot grill…we had just finished our meal of grilled meats and veggies. Once the slices began to soften as they cooked, they got flipped, and spread with a small amount of pure maple syrup. Cooked another 2 minutes with the syrup soaking in, then taken off and enjoyed hot!